There are cases where the GPS signal is too weak (e.g inside the house) to accurately find the location of a point or there are cases where the distance between two points is smaller than the GPS accuracy. In this case, we have to manually give the position of the points. 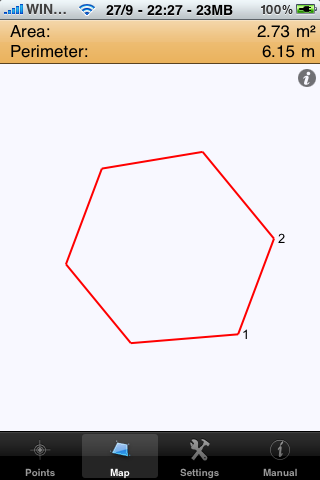 We will demonstrate how to manually give the points by drawing a regular hexagon, as the one shown in Figure 1. The first thing that we need to do is to decide whether we want to move in a clockwise or a counter clockwise direction. Lets suppose we decided to move in a counter clockwise direction. It won't affect the final solution! Next, we press on the "Add Points" button. 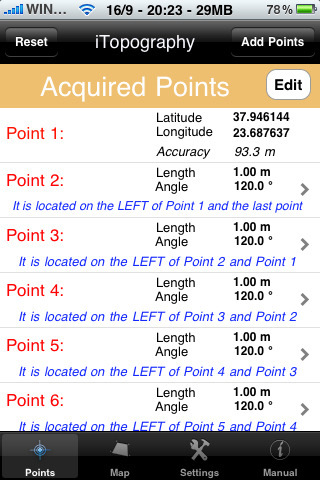 If this is the first point, iTopography will use the GPS device to find the longitude and latitude of our location. Do not worry about that, you should consider this point as the origin with coordinates x=0, y=0 or (x,y)=(0,0). Since we want to draw a hexagon, we need to add 6 points. So press again the "Add Points" button, to add the second point. Because the GPS signal is weak (or because we did not change location), iTopography will ask us if we want to manually add this point. Click "Yes", and you will see the screen on Figure 2. This form will assist us to add the 2nd point. Since we want to draw a regular hexagon we know that all its angle vertices are 120o. Also we consider each side of this polygon to be equal to 1m. If we go back to Figure 1. we observe that as we move in a counter clockwise direction the next point will be on our left hand size. So we fill this form out as it is shown in Figure 3. 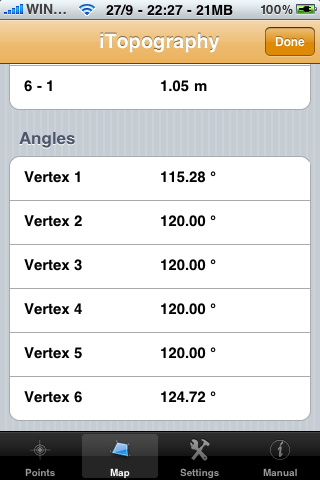 Since we know the angle of the vertice, we choose "Degrees" for the angle unit. 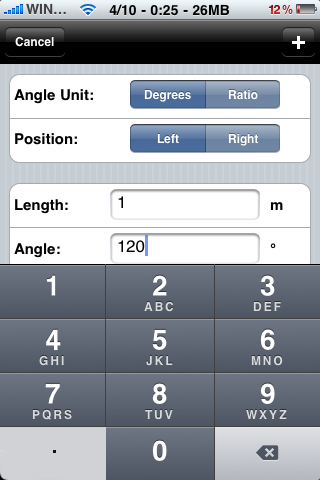 If we did not know the angle, then we would have use the "Ratio" for the angle unit. The reader may click on the button "Instructions" at the bottom of the form to learn how to compute the ratio (see Figure 2.). If you finished typing, press on the button with the "+" icon to add the point. If we continue the above procedure for the other 4 points, we will get a list similar to the one shown in Figure 4. 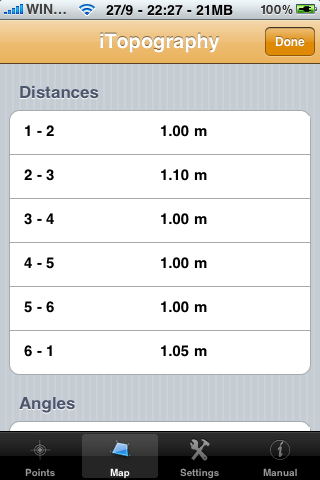 Most likely the first point would have a different longitude and latitude, but do not worry about that. It won't affect the solution! To summarize, we have acquired 6 points, and we asked each point to be 1m away from the previous point, and the angle of each vertex to be equal to 120o. 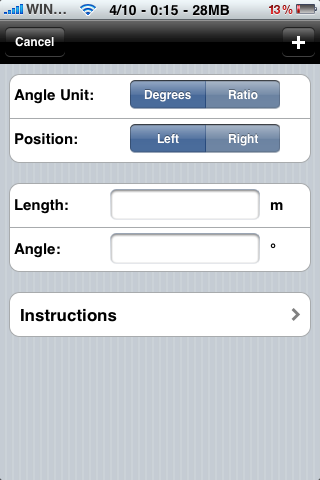 If you click on the Map tab (this is the second tab at the bottom of your iPhone screen), iTopography will compute the coordinates of these 6 points, and you will see the surface shown in Figure 1. 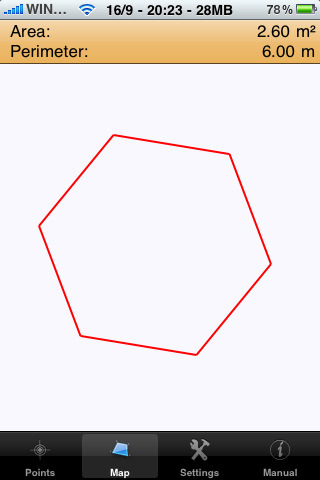 At the top of that Figure, you read the area and the perimeter of the hexagon. That wasn't difficult, was it? Lets now assume that one side is 1.1m, a little larger than 1m. Because we do not know what the angle of the vertices should be equal to, we will assume that they are equal to 120o. We do, however, know that this is not correct!! But, lets see what iTopography can do. In Figure 5. you see the list with the points. Did you notice that the 3rd point is 1,1m away from the 2nd point? As we see in Figure 6. iTopography did not have any problem to calculate the coordinates of these 6 points. Note that the area and the perimeter are now different, as they should be!! What is the angle of each vertex equal to? Did you notice the icon with the calligraphic letter "i" on the top right corner? Also, did you notice that the first two points are labeled on the map? Now, we know where the 3rd point is on this map. If you click on that icon, you will get the images depicted in the following two Figures (7 and 8). Note, that iTopography has calculated the correct vertex angle for this surface. Therefore, even if you do not accurately know the vertex angle, iTopography implements an algorithm that would try to rectify your miscalculation and compute the correct angle. Certainly, this code can not rectify large miscalculations, and if the vertex angle is totally wrong you will get an error message saying that it was not possible to compute the coordinates of the points. But, we are thinking of ways to improve this algorithm! !